I’m not sure what happens to a person’s brain when they purchase a supercar, but it seems to be a bit overwhelming for some individuals and they start to lose their grip on reality, as evidenced by this haggard and needy Aston Martin DB9. It may need a bit of everything, but here’s how you can do it on a budget, if you’re not afraid of getting dirty. If you don’t, I will. This 2005 Aston Martin DB9 is one of the most beautiful cars ever made. Well, not this one in particular. This one’s been beaten with a Mansory-branded ugly stick and neglected mechanically and aesthetically. Its 6.0 liter V12 engine that once proudly sang the 450 horsepower song of its people, currently needs extensive work and would probably do well with a replacement. The body, however, as an aftermarket kit installed that isn’t painted well, nor is the fitment or look fitting of a car of this stature. Although the interior color and condition is quite outstanding, this Aston has a ton of cons to weigh down its obvious pros. At less than a $20,000 asking price with likely lots of room for negotiation, it’s the most hand-built modern British engineering you can get for that kind of money, with or without a working engine. “Hey Travarnish, are you suggesting that someone buy an expensive car without a working engine?” you write as you feign filling out Monster.com applications to keep your mom off your back. No, I’m not suggesting that just anyone should do this. It’s an extremely challenging project with a platform that has little margin for error, and a potentially wallet-killing price tag. Only take on a project like this if you’re sure that you’d be able to eat any additional costs without using your children as kindling on cold winter nights to save money. Having said that, there really isn’t anything on this model that warrants particularly special repair knowledge. 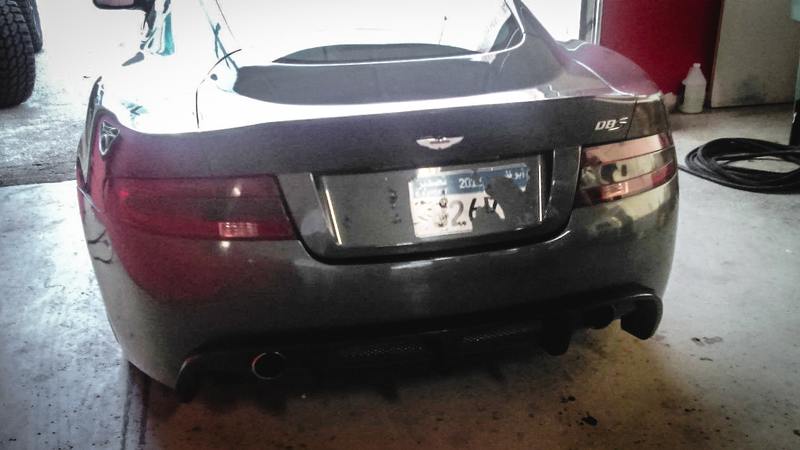 The DB9 has a relatively simple naturally aspirated V12 engine and automatic transmission. Space may be tight, but an engine hoist, some hand tools and several weekends in a two-car garage should do the trick, especially since engines can be sourced online without too much fuss. After doing 30 seconds of searching, I’ve found an assembled, identical model year long block that has been tested and cleaned and just needs the manifolds and accessories put on it (which the DB9 should already have) for a negotiable price of just over $13k, which is peanuts when you consider it’s a hand-built 12 cylinder engine made for a European supercar. Make no mistake, this car is a gamble. If you play your cards right, you could potentially end up with a ~$30,000 Aston Martin DB9 that you rebuilt yourself, but if you tried to outsource labor and got dealer-supplied parts, you could end up with a car that costs more than a lower-mileage unmolested example. The difference is in how thorough you’d like to be when it comes to inspecting the car, and doing your homework as far as what fixes the car would require. The engine as the car’s main mechanical issue can be sorted with the solution above, and body panels are surprisingly affordable for a bespoke car like this. Paint is paint and a bolt is a bolt. I desperately want to take on this project, but as I already have more projects than countin’ fingers, I’m going to begrudgingly offer it to my frugal and opinionated readership. It’s worth checking out at the very least, although I am rooting through my account to see how I can manage this without having to eat nothing but Spam for another year.